Why Does Dish Soap Cut Grease? 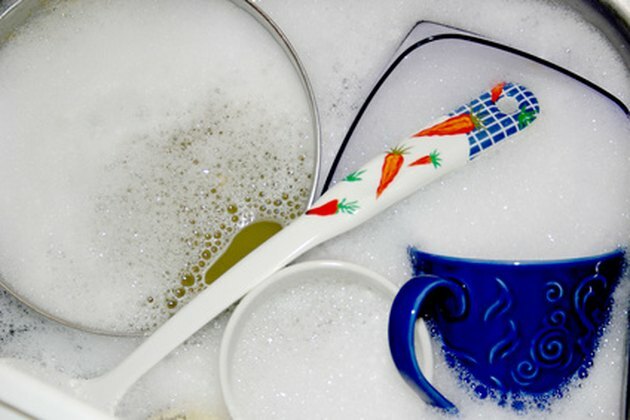 You might initially think that the power of dishwasher jets would be enough to get your dishes clean. Try to run the dishwasher (or even wash by hand) with no soap, however, and you'll quickly find this isn't the case, and that greasy plates stay greasy. Almost every detergent manufacturer claims the soap is "tough on grease," but the majority of manufacturers don't reveal what really makes dish soap "cut" grease. A good soap attracts many grease molecules. To understand how dish soap cuts grease, you have to understand how dish soap is structured at a molecular level. According to the British Broadcasting Corporation (BBC), the molecular strands of soap have one polar end and one nonpolar end, meaning one end has molecules with positive and negative charges while the other end has no particular charge. Water molecules similarly are polar, while grease molecules tend to be nonpolar. When you put dish soap in water, the polar end of the soap molecule wants to stick to water molecules, because polar substances tend to attract each other. At the same time, the other end of the soap molecule wants to stick to the grease molecules, since nonpolar substances are attracted to each other. When both these attractions happen, the result is that the soap molecule acts like a surfactant, or like a link between the water molecule and the grease. It is a way to get the water and grease to connect, even though they'd otherwise naturally repel due to their natural electrical charges. Once the grease and water are linked, you can use gravity and friction to pull the soap and grease molecules away from your item along with the water molecules. Even if you get a "good" detergent that attracts grease well, you'll need to repeat the cleaning process, because grease molecules use up the soap molecules. This is why tough grease jobs still can take a while, even with an excellent soap--the more grease there is, the more soap molecules you'll need to remove them. The skin on your hands has natural oil on it. When you wash dishes, some of the dish detergent may stick to the oil on your hands. Consequently, you remove the oil from your hands, too. This means that your hands no longer have as much protection against moisture loss. This is why washing dishes can leave your hands feeling so dry, and why wearing gloves or putting on moisturizer after washing dishes is a good idea. Dish soap works the exact same way as any other soap, including body wash, shampoo, and laundry detergent. You can test this principle by placing a few drops of oil followed by a sprinkling of pepper in some cups. Place a drop of each soap in each cup and see where the pepper goes, so you can see how the water and grease molecules are moving. This is a great way to compare the strengths of dish detergents, if you aren't sure which to choose. 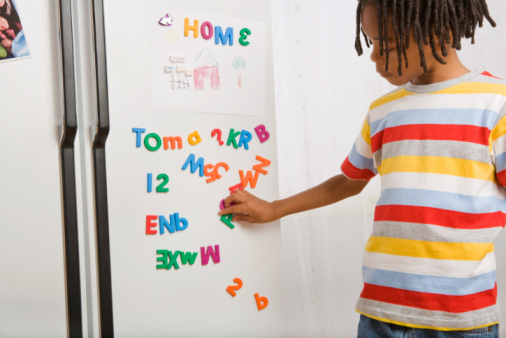 Why Do Magnets Stick to Refrigerators? What Oil Should Be Used in a John Deere Riding Mower?